The very lovely Ciara from @LegallyFit_ has just completed her six weeks ‘Eat Yourself Happy’ course, in conjunction with ourselves, WellFest and The Happy Gut Clinic. 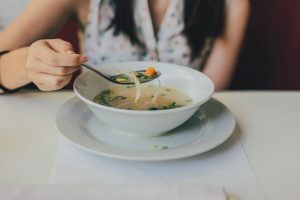 Completing a six-week course, with a focus on gut health, along with unlimited Sadie’s Kitchen Comforting Chicken Bone Broth, Ciara told us she “feels on top of the world!” But don’t take our word for it. Read on to see how Ciara got on! Fancy starting your own journey to better gut health? The ladies in The Happy Gut Clinic run clinics in Dublin and are also available for Skype consultations. Having suffered for years with stomach issues, feeling run down and regularly getting sick, I never thought that my situation would change. I have always presumed this was just how it was, that there was no cure for my IBS and other stomach issues. Throat infections and viruses were common, and I came to just accept them as something I was prone to. If you are like me and are also dealing with on-going issues like these, then I am here to tell you that you may not have to suffer like this. After finishing the six weeks ‘Eat Yourself Happy’ course, with Antoniette and Ger from The Happy Gut Clinic, I feel on top of the world! I haven’t felt myself getting run down and I have so much more energy. The exhaustion I have become accustomed to has become a thing of the past! The final three weeks of the clinic focused on what food to eat and how to cook and store those foods. I have branched out with my methods of cooking and have a deeper understanding of getting the most nutrition out of my meals. It has also allowed me to experiment with my cooking which is something I really relished. I have learned how to read and truly understand labels. It can be incredibly daunting walking into a big supermarket and attempting to understand the cleverly worded information on packaging, but a little knowledge really can go a long way to making this task more manageable. Not only this but I was also provided with amazing information on superfoods. Despite there being a new “superfood” announced every week, I learned about the true superfoods out there. And I was delighted to find out one of my favourite fruits made the list – the humble blueberry! In the midst of the final three weeks, I also got the lovely surprise from Sadie’s Kitchen of a delivery of their amazing new Super 7 Greens Bone Broth. This has become a personal favourite, especially when added to my ordinary bolognese recipe. It adds richness and flavour not to mention the wonderful benefits of bone broth! 1. When in doubt eat real food. 2. Try to eat the rainbow… And no, I don’t mean Skittles. 3. Take care of your gut. It really is that important. Finally, and most importantly, remember to enjoy the food you eat! Did you miss part one? Catch up here!